"Politics and power often run in families and dynasties, but I could find nothing in the ancestry of Theresa May to suggest that she would become the most powerful female politician in Britain as Home Secretary. Seen by some as a possible successor to David Cameron as Tory leader, she has said she wanted to be an MP ever since she was 12 years old, an ambition in which she was encouraged by her mother. Her father however, was an Anglican clergyman and kept his political views to himself. Some of Cameron's Cabinet are regarded as 'posh' and 'old school tie'. But there was no silver spoon for Theresa May. After education at a state primary school, convent girls' school and a state comprehensive, she read geography at Oxford University, graduating in 1977, became a London borough Councillor and got into Parliament for Maidenhead after twice losing in Labour seats. In researching her family background, I discovered that both of Theresa May's grandmothers were in domestic service as young women and that she had a great-grandfather who was a butler – so her roots are very much downstairs rather than upstairs. She was born Theresa Mary Brasier on 1 October 1956 in Eastbourne, Sussex, where her father, the Rev Hubert Brasier, was chaplain to a Church of England hospital. Her mother was the exotically-named Zaidee Mary Brasier, formerly Barnes. The name Zaidee is of Middle East origins. The Home Secretary lost both parents just a few years after leaving university and marrying her husband, Philip May, in 1980. The Rev Hubert Brasier, who became vicar of two Oxfordshire parishes, was killed in a car crash in 1981 and his wife Zaidee Brasier, born in 1928, died the following year, aged only 54. Theresa May's parents married at St Giles' Parish Church, Reading, Berkshire, on 16 June 1955, Hubert Brasier being then 37, a bachelor and a Clerk in Holy Orders, his address being the Chaplain's House, All Saints Hospital, Eastbourne. Zaidee Mary Barnes was 26, a spinster, of 156, Southampton Street, Reading. The bridegroom's father was Tom Brasier, deceased, and the bride's father was Reginald James Barnes, traveller. Tom (not Thomas) Brasier, was a bachelor of 29 and a sergeant in the King's Royal Rifles, based at the Rifle Depot at Winchester. His father was shown as James Brasier, builder. Tom Brasier's wife was Amy Margaret Patterson, aged 31, spinster - she was two years older than her husband when they married – of Ada Villas, Southampton Road, Fareham, and her father was David Patterson, deceased, a house steward. Tom Brasier, Theresa May's grandfather, was a professional soldier and in the 1911 census he's found in the Overseas Military section as a sergeant in the 4th Battalion of the King's Royal Rifles based in Chakrata, United Provinces, India. His birth place is shown as Wimbledon, Surrey. His wife, Amy, appears on another page in the same barracks, with the same reference, under, 'Return of wives and children of Officers and Soldiers', along with a 6-month old son called James, born at Chakrata. However, Amy's age was either seriously misrecorded or she lied about it, for she appears as being 24 when in fact she was almost 10 years older! Amy's birth place was shown as Plaistow, Essex. 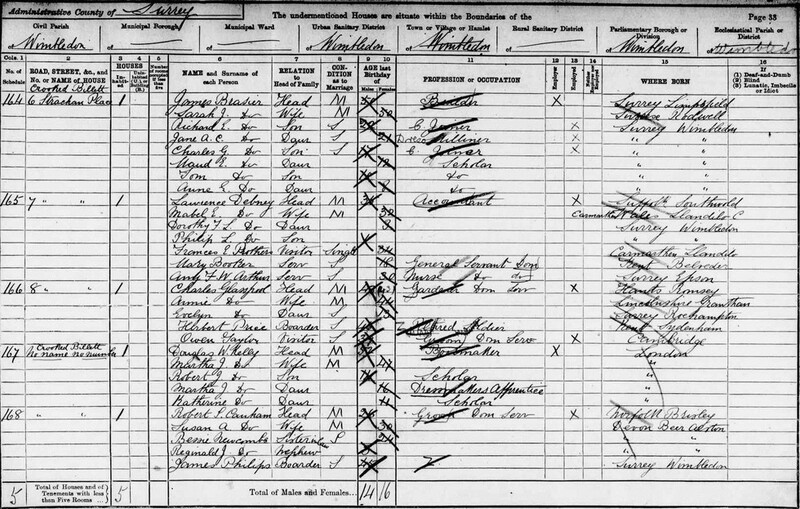 The GRO birth indexes confirm that Amy Margaret Patterson was born in 1878, while her husband was born in 1880. Tom Brasier became a sergeant-major in the King's Royal Rifles and survived World War I, dying at Wandsworth in 1951, aged 71. Amy Brasier died in 1967 at Oxford, aged 88. 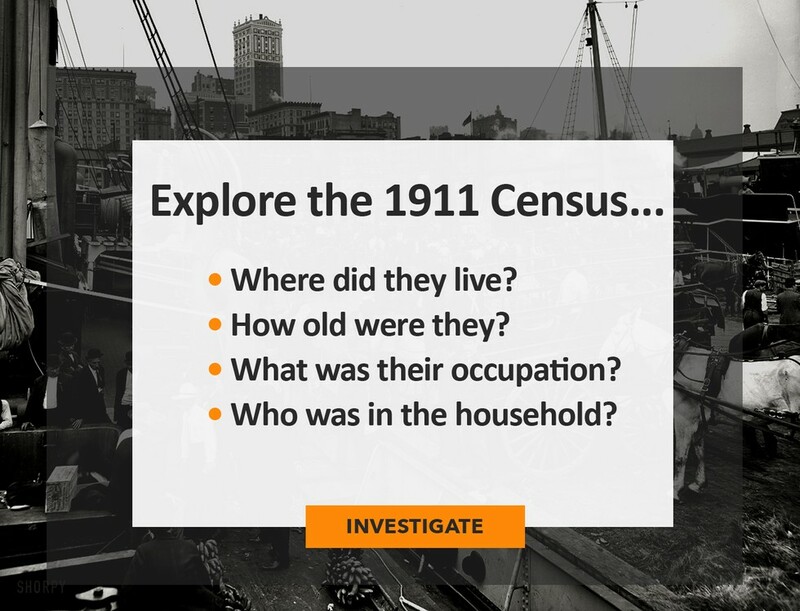 I couldn't find Tom in the 1901 census – possibly, as a full-time regular soldier, he was away in South Africa fighting in the Second Boer War. But Amy Patterson, Theresa May's paternal grandmother, then aged 22 and unmarried, was in domestic service as a parlour maid at 40 Lansdowne Road, Kensington, London, one of four servants in the household of a 65-year-old widow called Caroline Henderson from Liverpool, Lancashire, living on her own means, with two single daughters of 36 and 29. 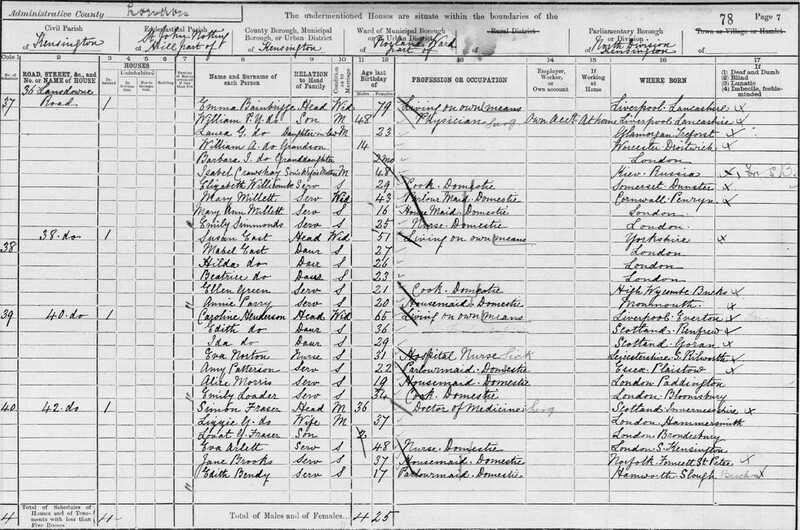 1901 Violet was only seven and with her parents in Reading, but in the census of 1911 she too was in domestic service at 18 Redlands Road, Reading in the household of a university physics professor from Australia called Walter Geoffrey Duffield, aged 31, and his wife Doris, 29. Though only 17, Violet was employed as a nurse and I assume she was looking after the Duffield's 11-month old daughter Joan. Brasier, and five siblings at 6 Strachan Place, Crooked Billett, Wimbledon, on the edge of Wimbledon Common. James Brasier was aged 50, a builder, born at Limpsfield, while his wife Sarah was also 50, born at Rodmell, Sussex. Their children were: Richard, 22, a joiner; Jane, 21, dress milliner; Charles, 17, joiner; Maud, 12, scholar, Tom, 10, scholar; and Anne, 8, scholar. All the children were born at Wimbledon. James Brasier and Sarah Jane Barnes, Theresa May's great-grandparents, were married in 1865 at Lewes, Sussex, registration district, probably in the bride's parish of Rodmell. 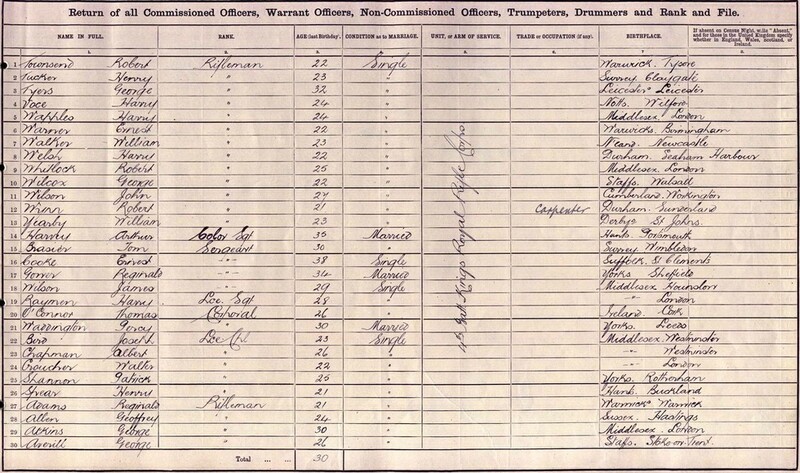 By the 1871 census they were already in Wimbledon at Belvedere Cottages, St Marys. James was a carpenter and they had two children, Richard E Brasier, 2, and Jane Ann Clara Brasier, 1. in 1881 their family had grown to six and they were at 8 Chesnut Place, Crooked Billet, Wimbledon. 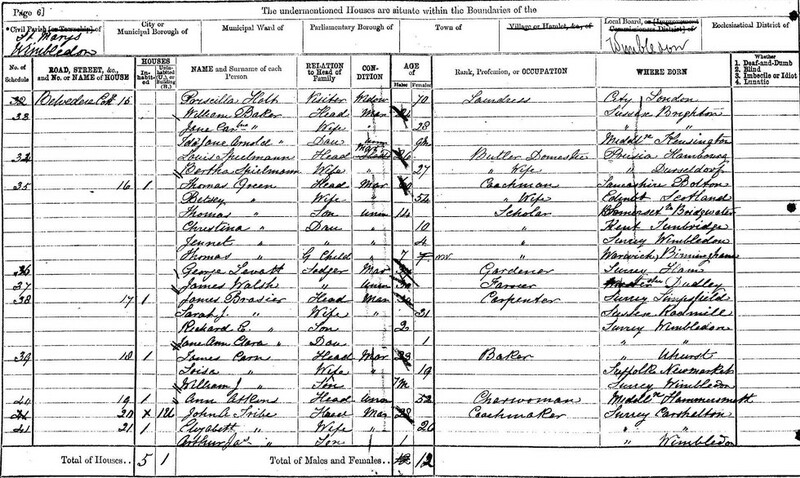 The children were: Richard Edward 12; Jane Ann 10; James Charles 9; Charles George 7; Maud Eliza 3; and Tom 1. As the birth place of James Brasier was consistently given in every census as Limpsfield, Surrey, I looked for him in 1861. I found him quite easily living with his parents, Richard and Ann Brasier, who were the great-great-grandparents of Theresa May. They were found at Limpsfield, with the address given only as 'Village'. 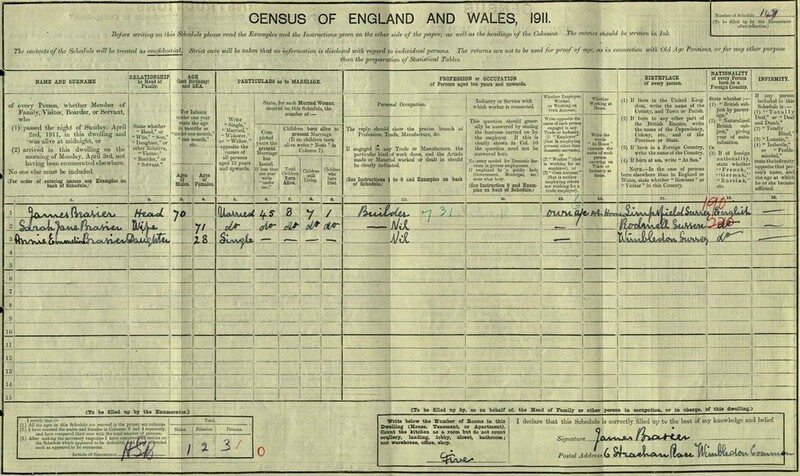 Richard Brasier was aged 49 and a master carpenter, his wife Ann being the same age, both shown as being born in 1812. Richard's birth place, however, was given as Greenwich, Kent, and his wife's as Walton-upon-Thames, Surrey. They had six children, all born at Limpsfield: James 20, a carpenter journeyman; Maria 17; Charles 15, also a carpenter journeyman; Emmeline 12; John 10; and Emma 8. Ten years earlier in 1851 the family were also in Limpsfield with Richard again shown as a master carpenter and his wife Ann as an infant school mistress. Four of the children were as shown in 1861 but there was an older daughter, Clara Amelia, 12, and Emma had not yet been born. 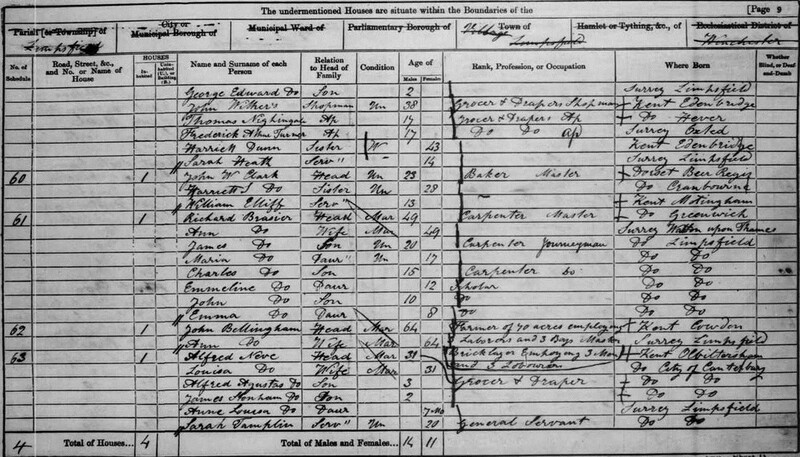 In the 1841 census I found what were almost certainly two generations of the Brasier family at Limpsfield, living close together and enumerated on the same page. Richard, 30, and Ann Brasier, 25, were there with four children: Richard 8, Charlotte 4, Clara 2 and James 8 months. Remember that in 1841 the ages of adults over 15 were usually – but not always - reduced to the nearest lower multiple of five. Apparently just a couple of doors away were James Brasier, 58, a carpenter, Ann Brasier, 59, and three children, Charlotte 21, Emma 15 and Mary Ann 5. 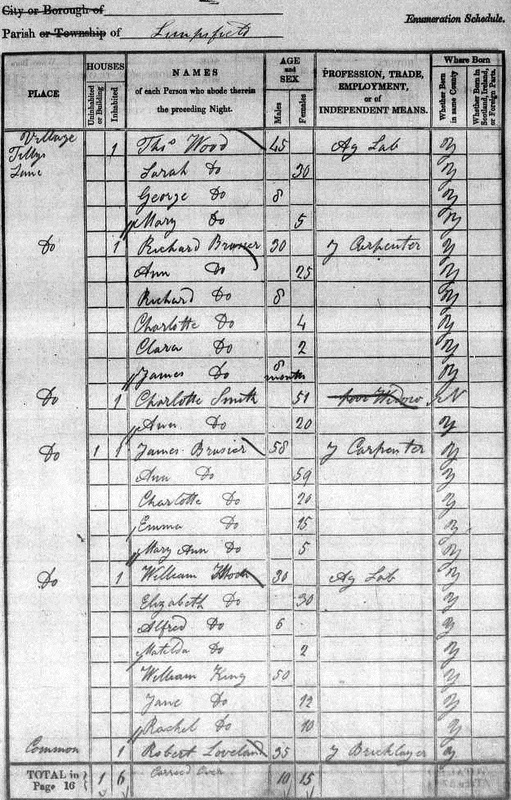 Because of the considerable difference in age, it seems possible that James and Ann Brasier were Richard's parents, who were said to have been born in 1783 and 1782 respectively. If I surmise correctly, they were the 3x-great-grandparents of Theresa May. During my online trawling, I found a reference to a house called Brasier's Cottage in Limpsfield, which still stands today, and a mention that the family had been in Limpsfield since about 1690. However, I bore in mind that Richard Brasier had given his birth place not as Limpsfield but as Greenwich, Kent, and I found in the International Genealogical Index (IGI) a marriage at St Mary's, Lewisham, Kent, on 15 August 1831, of Richard Brasier to Ann Needle. I couldn't find a baptism for Richard but I found at Walton-on-Thames on 6 July 1809 the birth of Ann Needles [sic], daughter of Thomas and Mary. Also on the IGI is the baptism of James Brasier at Oxted – very close to Limpsfield - on 22 September 1782, son of Richard Brasier and Ann, who could have been the 4x-great-grandparents of Theresa May. Who'd have thought it? The home secretary achieved her dream of becoming PM. On a separate note, I'd like to return to my earlier mention that the Home Secretary, sorry, PM, had a great-grandfather who was a butler in service. He was the father of her paternal grandmother, Amy Margaret Patterson, and he was called David Paterson or Patterson (both versions appear in records). I researched his antecedents at the ScotlandsPeople website and discovered he was born in 1852 in a former mining village called Kennet in Clackmannanshire, on the north bank of the River Forth, the son of Alexander Paterson, labourer, and Margaret Watson. He married Jane Poole, who was from Southwark, London, in Glasgow in 1875 and the couple moved to England, where David was found as a butler at Wimbledon in the censuses of 1881 and 1891, living not far from James Brasier and his family. David Patterson died at only 42 in 1893 and his wife was left a widow. It seems likely it was in Wimbledon that Theresa May's paternal grandparents, Tom Brasier and Amy Margaret Patterson, first met. Little could Amy, a butler's daughter and a humble parlour maid, have dreamed in her 'Upstairs Downstairs' world, that one day her granddaughter would become the most powerful women in Britain. Roy Stockdill has been a family historian for over 40 years. A former national newspaper journalist, he edited the Journal of One-Name Studies (for the Guild of One-Name Studies) for 10 years. 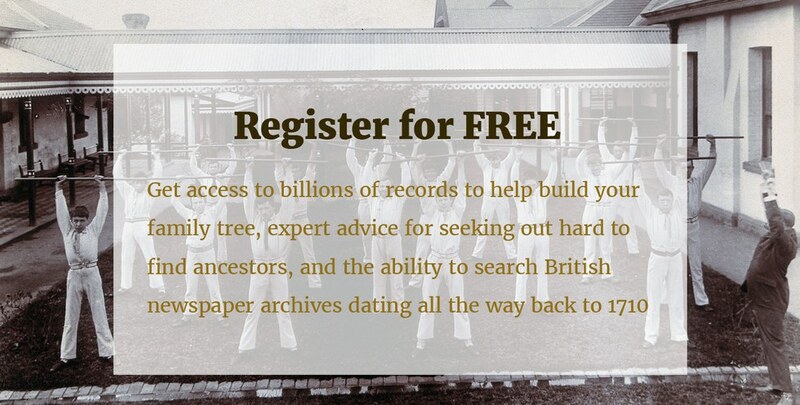 He is on the Board of Trustees of the Society of Genealogists and is commissioning editor of the 'My Ancestors…' series of books. He writes regularly for Family Tree magazine.